If you have never visited a homeschool convention before I highly recommend that you do. It is a great way to get encouragement, check out curriculum up close, and find a few deals and new friends along the way. I try to go to one every year if I can. As the years have gone by I am more enticed by the the opportunity to browse the Exhibit Hall full of books, games, kits, and so much more. My husband and I look forward to this time together to check out new things for the children. Since I know that many of you still have yet to attend one, I thought I would share some tips on how to best go about the day. 1. Wear comfortable shoes and clothing - some of these conventions are huge and take hours to walk around so be prepared and wear was you feel good in so you can go the long haul. 2. Plan early - Pre-register so you don't waste time when you get there. Book hotel accommodations if needed. Plan how you are going to eat (some places let you bring your own food while others offer food. If they don't find out what restaurants are nearby). You want to maximize your time there and not waste it on what could have been done beforehand. 3. Pray - I like to pray before I go. That God would help me to be wise with purchases and help direct me to the right curriculum for each particular child and their learning strengths. He has helped me every single time! 4. Make a List - I like to make a list of things that I need for each child. One year I needed new Grammar books for all the children and ended up finding some fresh new material that they really enjoyed. Don't go without a plan and wander aimlessly. 5. Know what speakers and booths you will visit - Read the itinerary ahead of time so that you know who you want to sit in on and which booths you absolutely must visit. This helps save so much time and helps you maximize your efforts there. 6. Take note of curriculum - Take full advantage of being able to go through the books you have been curious about and take note of them. Sometimes the covers look more enticing than the inside! It is also a great chance to talk to the booth owners and ask questions. Sometimes you can find something even better by asking around or browsing the tables. 7. Bring extra cash - I always find a little something extra to bring home to the kids for fun or something that I just know will be a blessing for me as a teacher. Bring extra cash but be sure to not blow the budget. 8. Know what to do with your purchases - Sometimes it is hard to carry that all around. You might want to use a stroller, luggage tote, or take your items out to the car periodically. Sometimes they even have a place where you can check your items in for a small donation. 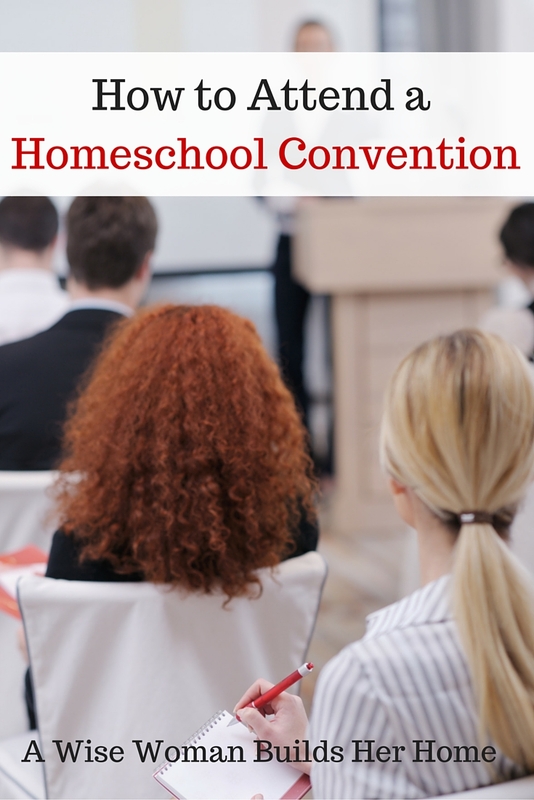 Do you have any tips to add for attending a homeschool convention?